Bobbin styles A, G, L, M, and U. Over 100 half-price selections. Free bobbin style template guide. Bobbins save time and improve productivity for serious sewing. 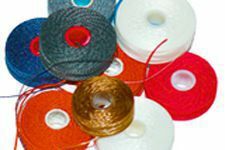 Buying the right bobbin comes down to knowing your machine's bobbin style (diameter and height), along with the size and type of thread wound on the bobbin. We make this easier with our and Machine / Style Reference and printable Prewound Bobbin Style Guide in pdf format for visual matching.